With the Democratic National Convention (DNC) less than two months away, the Philadelphia Police Department (PPD) has remained virtually silent on its security plans. Even less is known about the inevitable surveillance and infiltration that has become commonplace with the National Special Security Event designation assigned to the DNC and political summits like it. 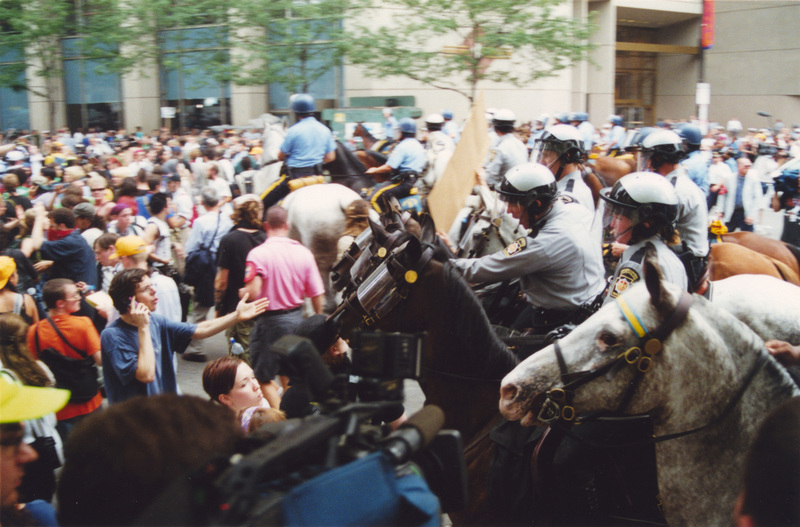 When Philadelphia hosted the Republican National Convention (RNC) in 2000, at least eleven Pennsylvania State Police (PSP) “troopers” were used to infiltrate political groups based on bogus claims that activists were planning violence and storing explosives in a warehouse filled with puppets, art and political messages. Absent any credible evidence, the city used so-called “intelligence” gathered by four troopers posing as union stagehands along with “Red Scare” propaganda to obtain a search warrant, arrest more than 70 people in the warehouse, and destroy all of the First Amendment material inside. The charges were ultimately dismissed, but the city achieved its legally-questionable, short-term goal of disrupting the political organizing and stifling the message of the protesters. As the criminal cases made their way through the courts, defense attorneys began asking why state troopers were used to infiltrate political groups instead of local police. The answer stems from a lawsuit filed nearly thirty years ago called Pledge of Resistance v. We The People 200. In 1987, Philadelphia police infiltrated multiple political groups protesting at the bicentennial celebration of the U.S. Constitution. To justify the plan to use more than two-dozen undercover officers in the operation, PPD outlandishly claimed that political groups were planning to kidnap and hold hostage a federal official. A federal judge affirmed the plaintiffs’ claims of rights violations in 1988 and issued a permanent injunction in the case. In addition to a settlement agreement reached by both sides, Mayor Wilson Goode issued a mayoral directive that—to this day—restricts the PPD from infiltrating nonviolent political groups without approval from the police commissioner, deputy commissioner, and the city’s managing director. Records recently obtained by journalist Dustin Slaughter confirm that the PPD policy is still in effect and embodied in its Standards and Procedures manual for the department’s Intelligence Unit. David Kairys, lead attorney for the plaintiffs, told the Philadelphia Inquirer at the time that activists had helped establish “the best procedure in the United States“ to protect against improper intelligence gathering. Indeed, the civil rights lawsuit filed by Kairys of the National Emergency Civil Liberties Committee, along with the local chapter of the National Lawyers Guild, and ACLU of PA, had far-reaching implications at a time of public outrage over domestic spying. In 2000, instead of getting the necessary approval when the RNC came to Philadelphia, the city avoided potential public scrutiny and relied on state troopers to infiltrate and gather intelligence that the city conveniently used to raid the warehouse. No smoking gun was ever produced showing the city did a deliberate end-run around its policy on infiltration. But, it was difficult to deny with multiple command centers housing local, state, and federal law enforcement agencies (think communications hubs, much like today’s fusion centers) established well in advance of the RNC 2000 protests. According to the Inquirer, Philadelphia plans to spend more than $5 million of its $43 million federal grant on reimbursement for the deployment of non-PPD law enforcement personnel. The Pennsylvania State Police is specifically named, however it’s unclear what form of support its troopers will provide. If history is any guide, the PSP will be conducting heavy surveillance and infiltration in the lead-up to and during the DNC. Pennsylvania State troopers were not only used extensively to spy on protesters at the RNC 2000, they have continued their questionable intelligence-gathering efforts over the years. Not only did the PSP monitor activists with impunity ahead of the 2009 G-20 summit in Pittsburgh, but it also used intelligence gathered by a private “security” contractor to harass and intimidate other activists. The PSP managed to side-step revelations that the Pennsylvania Office of Homeland Security (OHS) had hired the Philadelphia-based Institute of Terrorism Research and Response (ITRR) that same year to unlawfully spy on a diverse range of political groups (including those opposed to natural gas drilling, as well as antiwar and LGBTQ activists) posing no threat to the public. A few months before the exposure in September 2010 of an email from then-OHS director James Powers detailing the spying, state troopers paid a visit to the mother of Alex Lotorto, a 23-year-old activist who had called a meeting of friends to plan a demonstration against President Obama, scheduled to come to Carnegie Mellon campus the next day. What Lotorto didn’t know at the time was that he was being monitored by ITRR and the details of his communications had been sent to a host of law enforcement operatives including the PSP. Instead of approaching Lotorto where he lived in Pittsburgh, state troopers went to his mother’s home more than 300 miles away in what Lotorto called a blatant attempt to pressure him into abandoning his protest plans. Three years after the OHS debacle and Powers’ resignation, state police were again implicated in using information gathered by a private intelligence firm—this time, Global Security Corp—to harass political activists. Ignoring lessons from the prior abusive surveillance operation, state trooper Michael Hutson showed photographs of several protest groups at a September 2013 natural gas-industry conference in Philadelphia at a presentation labeled, “environmental extremism and acts of vandalism across Pennsylvania’s booming Marcellus Shale natural-gas reserves.” Hutson provided no evidence tying the groups to any criminal activity. The following year, Hutson paid visits to at least two activists opposed to natural-gas hydraulic fracturing (fracking). Hutson crossed state lines to question Jeremy Alderson, a 66-year-old activist and publisher of the newsletter No Frack Almanac, who lives outside of Ithaca, New York. Wendy Lee, a 56-year-old philosophy professor at Bloomsburg University was the other activist. Both Alderson and Lee had been monitored taking photos of a gas compressor station in Lycoming County, however neither were trespassing and Lee, in particular, has posted thousands of online photos of wells, drilling rigs and compressor stations as part of her activism. Hubs of intelligence gathering and information-sharing called “fusion centers” started forming in American cities after 9/11. Fusion centers typically consist of local, state and federal law enforcement agencies, and often include personnel from the U.S. military, corporations, and private security firms like ITRR. Although fusion centers were originally established by the Department of Homeland Security (DHS) to improve the sharing of counterterrorism intelligence, they have since been expanded in order to “gather, analyze, and share comprehensive crimes, hazards, and terrorism information,” according to DHS. The primary fusion center in the commonwealth is called the Pennsylvania Criminal Intelligence Center (PCIC) located in Harrisburg. The PCIC is run the state police and was undoubtedly involved in the circulation of intelligence gathered by ITRR. In an effort to expand this type of “all hazards” intelligence coordination, the City of Philadelphia opened a new state-of-the-art fusion center in 2013, after years of delays and enormous cost over-runs. While the stakeholders and information-sharing objectives are similar to the PCIC and other fusion centers around the country, Philadelphia’s fusion center known as the Delaware Valley Intelligence Center (DVIC) is under the direction of local law enforcement, PPD Inspector Walt Smith. It seems clear from the participation of Pennsylvania and Philadelphia police as stakeholders in the city’s fusion center that information sharing between the two agencies (among others) would be taken for granted. However, we can expect secrecy and obfuscation around such intelligence collaboration for the DNC 2016. In 2000, thirteen years before the DVIC opened its doors, the state and local police (along with the FBI, Secret Service, and other agencies) operated under the same roof near 20th & Oregon Streets in what was referred to by the Inquirer as a multi-agency “command center“ in advance of the Republican convention. When then-PSP Organized Crime Commander Lt. Col. George Bivens (recently demoted) was questioned during RNC-protest criminal cases about the use of undercover agents to assist the Philadelphia police, he denied any coordination. Furthermore, Bivens claimed that he and his undercover agents never kept written notes and only spoke with each other about the operations. Whether true or not, the lack of any documentation on undercover operations and communication between PSP and PPD allowed Philadelphia police to take advantage of widespread infiltration despite a policy restricting such activity in the city. It’s hard to believe that even after the spotlight was shined on Philadelphia and state police, and the damaging PR it caused both agencies—with critical editorials in the Inquirer and Daily News—they would try the same dubious tactics for the DNC 2016. But, unfortunately, history has shown a pattern of this kind of abusive infiltration at political conventions. At every Republican convention since 2000, local and federal law enforcement have engaged in infiltration seemingly without cause. In 2004, the videographer collective I-Witness video captured footage of several undercover police sometimes engaging in violence and provocation at the RNC protests in New York City. In 2008, multiple federal agents and informants spied on activists and disrupted political organizing in advance of the RNC protests in St. Paul. FBI informant Andrew “Panda” Darst was among multiple infiltrators of the activist-led RNC “Welcoming Committee,” and an FBI agent known as “Karen Sullivan” not only attended organizing meetings of the Twin Cities Anti-War Committee in the lead-up to the RNC, but then took a more active role in the group by “chairing meetings, handling bookkeeping, and communicating with dozens of other organizations,” according to Democracy Now. Notorious activist-turned-FBI informant Brandon Darby entrapped two young Texas activists who drove from Austin to protest at the RNC 2008. His influence over—and coercion of—Bradley Crowder and David McKay in making (but not using) Molotov cocktails resulted in terrorism charges and years in jail for both of them. Despite the low turnout of protesters at the RNC 2012 in Tampa, the policing apparatus was nevertheless robust and the infiltration was especially invasive. Not only did Tampa police make “widespread use of undercover operatives to gather intelligence,” according to Cleveland.com, but Major Marc Hamlin bragged at a “security” conference in Cleveland that the “organizational structure [of protesters] was extremely weak,” allowing undercover officers to infiltrate and “take over” a protest group. Has Philadelphia learned from its past transgressions? According to Kairys, the policy on infiltration and intelligence-gathering was put in place to make the police more accountable to the public and, in so doing, limit abuse. “And when infiltration does happen,” he explained, “there would at least be some basis for it, otherwise high-level public officials will be risking some embarrassment.” Furthermore, if it can be shown that Philadelphia police were somehow involved, the risk to the city could also include having to defend itself against civil lawsuits. But the bigger take-away for Kairys is not to let infiltration interfere or slow down people’s activism. He likened the type of infiltration that gave rise to the Pledge of Resistance lawsuit—in which police announced weeks in advance they would be infiltrating political groups—to the intimidation tactics of the federal government’s counterintelligence program (COINTELPRO). In that era, the FBI tried to “enhance the paranoia“ among political groups and “get the point across there is an FBI agent behind every mailbox” in an effort to deter dissent. This piece first appeared in Huffington Post and is republished with the author’s permission.